Sean Chambers released Live from the Long Island Blues Warehouse in 2011, which featured 10 tracks of mostly originals, along with Sean’s distinctively searing takes on “Full Moon on Main Street,” a highlight song from an early album by The Kinsey Report; as well as a blistering version of Elmore James’ “Dust My Broom,” which recalls Johnny Winter in its approach. Live from the Long Island Blues Warehouse appeared on BB King’s Bluesville XM/Sirius Blues Charts as a “Pick to Click” for 6 weeks in a row, as well as 15 weeks on the RMR Weekly Blues Roots Chart and 11 weeks on the House of Blues Radio Chart. The album was voted “Best Live Blues Album of 2011” by Canada’s Blues Underground Network and ranked as one of the Top 3 Live CD’s in Germany by the magazine Wasser Prawda. In addition it was nominated for a Jimi Award for “Best Live Blues Album of 2011.” Guitar Player Magazine did a full page feature story on Sean in February, 2012, and the same month Vintage Guitar Magazine ran a two page feature story. On October 15, 2013, Sean Chambers released The Rock House Sessions, on Blue Heat Records. The album received great reviews and was also nominated for a Blues Blast Music Award in 2014 for “Best Blues Rock Album of the year”. The album was recorded at Rock House Studios owned by acclaimed keyboardist -Kevin McKendree (Delbert McClinton Band) – hence the album name The Rock House Sessions. 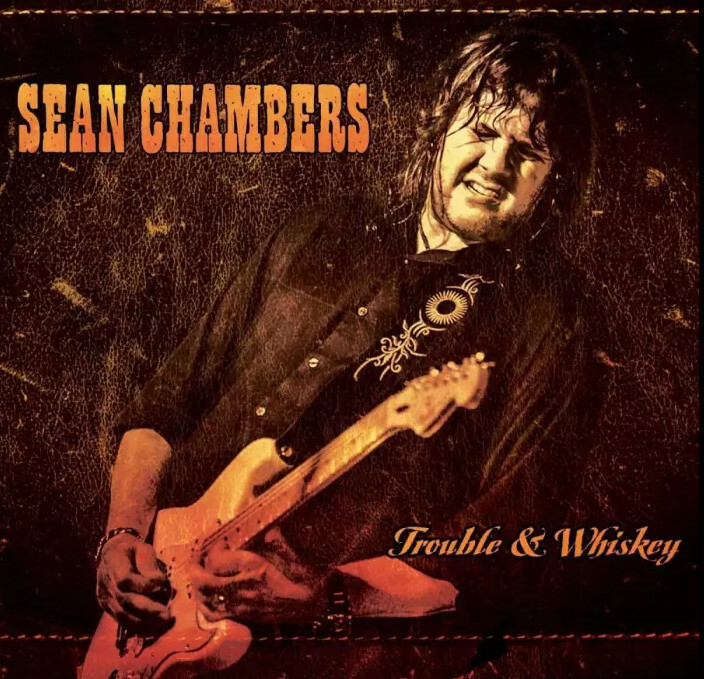 On March 17th 2017 Sean Chambers will release his newest album entitled “Trouble & Whiskey” on the American Showplace Music label. The album is produced by Ben Elliott who has recorded classic artists such as Eric Clapton, Keith Richards, Billy Gibbons and Les Paul among others. The core band on the album aside from Sean on lead vocals and lead guitar includes Michael Hensley on Hammond B3 & keyboards, Todd Cook on bass and Kris Schnebelen on drums. Special guests include Jimmy Bennett on guitar on track #8, John Ginty on Hammond B3 on track #4, and Andrei Koribaniks on percussion on tracks #1 and #7. Trouble & Whiskey features 10 tracks which include 7 new original Sean Chambers compositions, and 3 well chosen covers including “Bullfrog Blues” by Rory Gallagher, ‘Cut Off My Right Arm” by Johnny Copeland and “Be Careful With A Fool” by Riley B. King/Joe Bihari.